A contemporary of Mahler, Wolf�s reputation now rests almost entirely on songs. His complete output of chamber music is contained on this disc, only the serenade being well-known. All are relatively youthful works, written before the long-term effects of syphilis led to serious mental decline. Wolf�s underlying manic-depressive nature is perhaps illustrated by the gestation times of the quartet and serenade - 6 years and 3 days respectively. It is probably also fair to suggest that he was much more at home in smaller forms. Nevertheless, the quartet is a considerable achievement that should not be consigned to oblivion. The quartet is in four movements with a brief scherzo placed second. Throughout the work there is a dark passion which is amply conveyed by the members of the Wihan Quartet. As Rafael Brom suggests in the booklet notes, the influence of Beethoven is apparent in the first two movements. In particular, there are passages reminiscent of the Grosse Fuge and Op.95 quartet. Throughout the work I was also reminded of Schubert�s Death and Maiden quartet which is in the same key. The long-breathed and lyrical slow movement is Wagnerian � there is no doubting whose side Wolf was on in the Wagner �v� Brahms slanging match which gripped Vienna at the time. After an opening recalling the Bruckner quintet - written just a few years earlier - the finale perhaps contains the most original and compelling music. The intermezzo is well-crafted and generally sunny. The lyrical opening theme is magical but Wolf does not linger on it quite as might be expected; contrasting playful passages are woven in. The soubriquet Italian was apparently added to the serenade well after its composition and he also prepared an orchestral version. Its charms are readily apparent in this performance which sparkles from beginning to end. 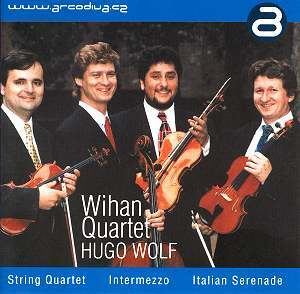 The Wihan Quartet takes it name from Hanu� Wihan (1855-1920), cellist and founder of the Bohemian Quartet. They are following, and live up to, a proud tradition of Czech quartets with some really excellent music-making here. The recording is near ideal and, although there is a modicum of competition in this repertoire, it is hard to imagine this being bettered.